Our through the wall post boxes are a great way to retrieve your delivered post from the back of the system. 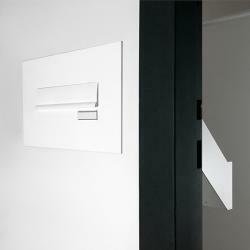 Both traditional and modern through the wall post boxes are available, manufactured in resilient materials. Our traditional heavy duty cast aluminium through the wall post boxes, are ideal for period style properties, highly robust and guaranteed not to corrode in weather conditions. 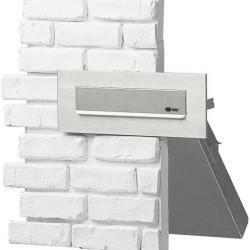 Medium and large adjustable depth through the wall post boxes, are popular due to their discreet design fitting through any wall or pillar. Our breach telescopic post boxes are extendable, whilst offering a large letter plate and capacity for large items and parcels. Our Norvin post boxes feature an anti-fishing device, making it almost impossible for post to be removed via the front, with an adjustable chute angle too. A secure locking system, supplied with 2 keys is offered throughout our post boxes, keeping your post protected. To view further features of our through the wall post boxes, simply select the images below. Please browse through our range and choose one of our easy to fit options today. If you have any questions regarding our through the wall post boxes, please contact us.